Vaca Frita is one of my absolute favorite Cuban meals. It’s simple, stuff but super flavorful and everyone usually loves it. Especially my college roommate. She really loved it. Vaca Frita literally translates to “Fried Cow”. Sounds appetizing, approved no? Well, no. But I promise you, it is mouth-watering, addictive and delicious. So, what exactly is this fried cow? It’s flank steak, chopped into squares and boiled with an onion and a bay leaf until tender, then shredded and sauteed with onions, lime juice and orange juice. 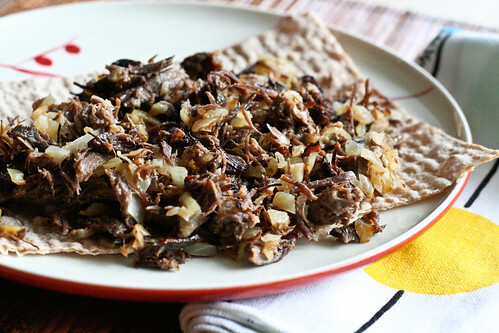 Traditionally, the beef is sauteed in a skillet with lots of oil until crisp and brown. This method is a little greasy for me, so I saute everything in a pan, then spread it onto a cookie sheet and pop it under the broiler to get the same browned and crispy results. It’s a tangy, beefy meal that’s great on rice, with salads and definitely in sandwiches! As a bonus, you get some deeply flavorful stock for soups. If you’re looking for a unique and tropical way to prepare flank steak, this dish is for you. Remove the steak with a slotted spoon and let cool to room temperature. (Run the remaining ilquid through a fine mesh sieve and use as a base for soups, or freeze.) Use 2 forks or your hands to pull the steak apart until it resembles pulled pork. Mix the orange and lime juice together in a small bowl or measuring cup. Preheat your oven’s broiler. Heat a large skillet over medium-high heat and add the olive oil. Once the oil is hot, add the chopped onion and sautee until soft and beginning to brown, about 7 minutes. Add the shredded steak and half of orange/lime juice. Saute for 2 – 3 minutes, then taste and add more orange/lime juice and salt to taste. I usually end up using all or most of the juice. This depends on the size of your citrus and how juicy it is. Spread the contents of the skillet onto a cookie sheet and place under the broiler until the beef and onions crisp and brown, about 10 minutes. Remove and serve with rice, salad, potatoes or in a sandwich with some Gruyere cheese. Lime and orange juice on steak sound PERFECT! These would be awesome innards for some sort of panini! Hmmm, thanks for the idea! Vaca Frita is one of my fave Cuban dishes too (out of many). This looks fabulous! My favorite little Cuban place closed down a few months ago. Now, I’m missing it even more! This dish looks soo good!!! What kind of bread is shows in your picture? Looks AMAZING! Really – who can go wrong w/that? jamie – I’d put the flank steak, citrus, salt, onion and 1 cup water in the crock pot. When you’re ready to eat, shred it with a couple of forks, spread it all out on a cookie sheet and broil for 10 minutes. I look at the picture, read the ingredient list, look at the picture again — and I’m drooling already. This is bookmarked: thanks! I have flank I can thaw out to satisfy the craving this entry caused. I saw this recipe a while ago and was looking forward to making it since then. Last night I finally gave it a shot, putting it in burritos with black beans covered in homemade mole sauce. It tasted and smelled delicious the whole way through, until the broiling. I had planned on broiling for ten minutes, but everything was burned horribly after less than five and I had to discard almost half. Anyone making this should try and keep a very close eye on it once it’s in the broiler. Darling, it may be shameful how excited I am to make this for dinner tonight. Anything called fried cow is sure to make my mouth happy. Study final results and sensible encounters prove that the current standardized steel rolling bearing can very own infinite fatigue power if it’s not much achievable for the bearing to possess great lubrication, the environment cleanness and load. It was set up as a free market for fish, with permission to sell mackerel on Sundays, by an Act of Parliament in 1699 and was the only place that fish could be sold wholesale anywhere between Gravesend in Kent and Windsor in Royal Berkshire. In order to keep its corrosion resistance, its surface cannot be damaged in the process of installation and use. Remarkable blog layout here. Was it hard creating a nice looking site like this?